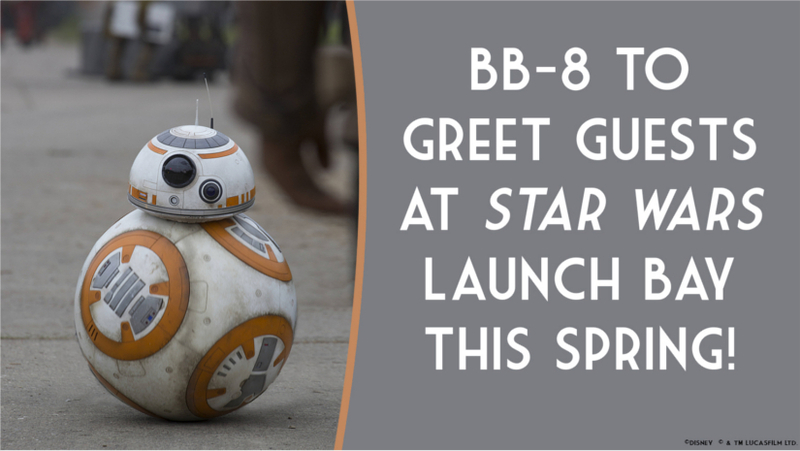 This spring, Guests visiting Disney's Hollywood Studios will have more Star Wars fun to look forward to when BB-8, the loyal droid from Star Wars: The Force Awakens, begins character greetings at Star Wars Launch Bay. Making his character greeting debut as part of Star Wars Galactic Nights on April 14, BB-8 will appear in addition to Kylo Ren and Chewbacca, two characters from the Star Wars galaxy who regularly encounter Guests at Star Wars Launch Bay, located within Animation Courtyard. In addition to character greetings, the location also offers Guests the chance to explore multiple galleries filled with treasured memorabilia and authentic replicas of large-scale Star Wars artifacts, including some from the latest film in the franchise, Rogue One: A Star Wars Story. Star Wars Launch Bay is just one experience that has debuted at Disney’s Hollywood Studios to the delight of Star Wars fans over the past two years: “Star Wars: A Galaxy Far, Far Away” features characters from around the Star Wars galaxy; while the guest-favorite “Star Wars: A Galactic Spectacular” nighttime spectacular lights up the park each night. Guests age 4-12 can also become Jedi recruits and put their skills to the test in an unforgettable battle against villains like Darth Vader or the Seventh Sister Inquisitor. And just a few months ago, the park’s Star Tours – The Adventures Continue attraction began offering guests randomized destinations, making different planetary destinations possible for every galactic journey.